There are 2 ferry routes operating between Finland and Estonia offering you combined total of 91 sailings per week. Tallink Silja operates 2 routes, Helsinki to Tallinn runs 6 times per day & Mariehamn to Tallinn about 7 times weekly. Viking Line operates 1 route, Helsinki to Tallinn which runs 3 times daily. Eckerö Line operates 1 route, Helsinki to Tallinn which runs 3 times daily. As the frequency and duration of crossings on some routes varies we would advise that you do a live search for crossings from Finland to Estonia to get the most up to date information. 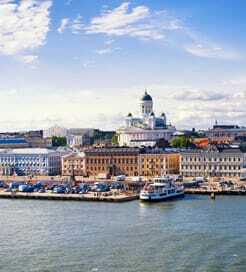 Finland is a Nordic country in northeast Europe, famous for white summer nights and countless pristine lakes. It offers amazing landscapes year-round, with many activities to suit every season. There are excellent ski resorts, bustling cities and incredible festivals throughout the summer months. The night skies are blessed with spectacular displays of the Northern Lights, too, making it one of Europe’s most popular countries. Finally, after a day of exploring the coniferous forests and drinking in the crisp Finnish air, why not relax in one of the nation’s estimated two million saunas? Travelling by ferry is a popular mode of transport in Finland, as there are numerous routes operated by excellent ferry companies with luxurious vessels. The Finnish ports are good departure points for the surrounding Scandinavian nations and mainland Europe, so there’s no shortage of sailing options. Estonia is a Baltic Nation in the north of Europe, comprising a mainland and over 2,000 islands in the Baltic Sea. Boasting one of the highest standards of living and fastest growing economies in Europe, Estonia is now an established tourist destination, emerging from Soviet rule in 1991. Like the country itself, Tallinn has flourished from a former Soviet city into one of the most fascinating capitals on the continent. It’s known for its enchanting medieval Old Town, which is the best preserved in Northern Europe, and fairy tale buildings found alongside an endless choice of bars, restaurants and upmarket hotels. When sailing to Estonia, there are many ferry routes on offer across the Gulf of Finland and the Baltic Sea from ports in Scandinavia and Russia. The crossings are operated by a wide variety of excellent ferry operators offering varying journey times.